Navigates PostgreSQL’s most popular features and hidden gems and covers topics such as configuration, administration, language support, and more. PostgreSQL is an open-source object-relational database with many enterprise-level features. It runs on numerous platforms: Linux, Unix, Windows, and Mac OS X. It is simple and quick to install, fast, and it sports advanced features such as: streaming replication, spatial support via PostGIS, windowing functions, table partitioning, and full-text search. In addition to its enterprise features, it has the added benefit of supporting numerous languages for authoring stored functions. It has an extensible procedural language architecture to introduce new languages. It also has an extensible type and index architecture for introducing new data types, operators, and indexes for these custom types, and support for querying external data sources such as CSV, web services, and other PostgreSQL services via its Foreign Data Wrapper (SQL/MED) support. 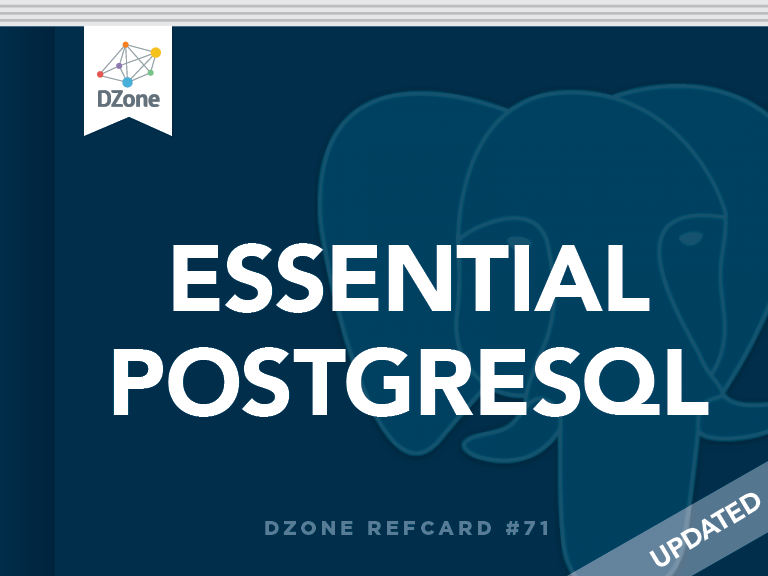 Targeted at novices and professionals alike, this Refcard will help you quickly navigate some of PostgreSQL’s most popular features as well as its hidden gems. It will cover topics such as configuration, administration, backup, language support, and advanced SQL features. There will be a special focus on new features in PostgreSQL 9.3 and 9.4. PostgreSQL uses three main configuration files to control overall operations. You can find these files in the initialized data cluster (the folder specified during the initialization process using initdb -d). postgresql.conf Controls the listening port, IP, and default query planner settings, memory settings, path settings, and logging settings. Can be queried via pg_settings database view. pg_hba.conf Controls the authentication models used by PostgreSQL and can be set per user, per database, per IP range, or a combination of all. pg_indent.conf Controls mapping of an OS user to a PostgreSQL user. The following settings are all located in the postgresql.conf file. Remember that these are default settings; many of these you can choose to override for each session, for each database, or for each user/role. listen_addresses Use ‘*’ to listen on all IPs of the server, ‘localhost’ to listen on just local, or a comma separated list of IPs to listen on. Requires service restart if changed and can only be set globally. port Defaults to 5432, but can be changed to allow multiple postgresql daemon clusters/versions to coexist using same IP but different ports. search_path List of default schemas that don’t need schema qualification. First schema is where non-schema qualified objects are created. constraint_exclusion Options: on, off, or partial. Partial was introduced in 8.4 and is the new default. Allows planner to skip over tables if constraint ensures query conditions cannot be satisfied by the table. Mostly used for table partitioning via table inheritance. shared_buffers Controls how much memory is allocated to PostgreSQL and shared across all processes. Requires service restart and can only be set globally. PostgreSQL supports many authentication schemes to control access to the database. The pg_hba.conf file dictates which schemes are used based on the rules found in this file. You can mix and match various authentication schemes at the same time. The rules are applied sequentially such that the first match fitting a connection is the one that is used. This is important to remember because if you have a more restrictive rule above a less restrictive, then the more restrictive is the one that trumps. The most commonly used authentication schemes are trust (which allows connections without a password) and md5 (which authenticates with md5 encrypted passwords). Others include: reject, crypt, password (this is plain text), krb5, ident (authenticate simply by identity of user in OS), pam, and ldap. The example pg_hba.conf entries below allow all local connections to connect to all databases without a password and all remote connections to authenticate via md5. date The date is a datatype to represent dates with no time. Default representation is ISO 8601 e.g. ‘YYYY-MM-DD’. Use datestyle configuration setting to control defaults. Constituents of datetime, use date_part function to extract century, day, decade, dow (starts Sunday), doy, epoch, hour, isodow (day of week starts on Monday), minute, month, quarter, week, year. int, int8 4 byte and 8 byte integers. serial, serial4, serial8 Sequential integers; this can be used during table creation to specify auto-numbered fields. numeric(s, p) Decimal numbers; s is scale and p is precision. percentile_cont, percentile_disc Continuous and discrete percentile aggregate. Can take a numeric value (between 0 and 1) for percentile rank or can take an array of numeric values between 0 and 1.
varchar(n) (a.k.a. character varying) Max of n characters, no trailing spaces. char(n) Padded to n characters. When used in a table, you define the column as the name of the enum. Sorting is always in the order the items appear in the enum definition. bytea Byte array used for storing binary objects, such as files. lo Large object. Stored in a separate system table with an object ID reference to the large object. Useful for importing files from a file system and storing and exporting back to the file system. jsonb Binary form of JSON—introduced in PostgreSQL 9.4. Can be indexed using GIN indexes and supports intersects and containment operators in addition to all the functions and operators JSON supports. Performance is much faster than the JSON type. No duplicate keys per object are allowed; sort of keys per object are not maintained. CURRENT_TIMESTAMP, now() Returns current date and time with timezone. CURRENT_DATE Returns current date without the time. CURRENT_TIME Returns current time without the date. age(timestamp, timestamp) Returns an interval spanned between timestamp1 and timestamp2. age(timestamp) Difference from current time. operators +, -, / (for intervals only) You can add (or subtract) intervals to datetimes. You can perform addition and subtraction between two datetimes. You can divide intervals into smaller intervals. generate_series(timestamp, timestamp, [interval]) [8.4] Generate rows of timestamps. || (string || string, string || number) String concatenation. left, right, substring Returns left x elements, right x elements, or substring from position x for y number of elements. length Number of characters in string. lower, upper, initcap Lower, upper, proper case. md5 Calculates the MD5 hash. quote_literal Escapes both single and double quotes. quote_nullable Similar to quote_literal but doesn’t quote NULL. string_agg SQL aggregate function that aggregates a set of values into a string. strpos(text, subtext) Returns numeric position of subtext within text. trim, btrim, ltrim, rtrim Trim spaces in string. array_agg SQL aggregate function that aggregates a set of values into an array. @> Contains range or element. && Have elements in common. + Union of 2 ranges. ->> Extract an element of JSON/jsonb as text. -> Extract an element of JSON/jsonb as JSON/jsonb (useful for doing more operations on a complex subelement). #>> Extract a nested element of JSON/jsonb as text. #> Extract a nested element of JSON/jsonb as JSON/jsonb. Useful for doing more operations such as working with arrays within json. row_number Number of current row from its current partition. rank, percent_rank, dense_rank Ranking based on order in current partition (dense_rank is without gaps; percent_rank is relative rank). lead, lag Nth value relative to current, -nth value relative to current (n defaults to 1) in current partition. first_value, last_value, nth_value Absolute first/last/nth value in a partition based on order regardless of current position. generate_series(int1, int2, [step]) generate_series(timestamp1, timestamp2, [interval]) Returns rows consisting of numbers from int1 to int2 with [step] as gaps. Step is optional and defaults to 1.
min, max, sum, avg, count Common aggregates. percentile_dist, percentile_cont [9.4] Useful for computing medians. Here is a listing of what you will find in a PostgreSQL server or database. An * means the object lives at the server level, not the database level. Databases* PostgreSQL supports more than one database per service/daemon. Tablespaces* Logical representation of physical locations where tables are stored. You can store different tables in different tablespaces, and control data storage based on database and user/group role. Languages These are the procedural languages installed in the database. Casts PostgreSQL has the unique feature of having an extensible cast system. It has built-in casts, but allows you to define your own and override default casts. Casts allow you to define explicit behavior when casting from one object to another, and allow you to define autocast behavior. Schemas These are logical groupings of objects. One can think of them as mini-databases within a larger database. An object always resides in a schema. Tables, Views Views are virtual tables that encapsulate an SQL SELECT statement. In PostgreSQL, tables can inherit from other tables and data can be altered against views. PostgreSQL 9.1+ introduced Foreign Tables, which are references to data from a Foreign source via a foreign data wrapper (FDW). PostgreSQL 9.3 introduced materialized views, which are views that contain the cached data. These need to be refreshed to update the view cache. Rules Rules are similar to triggers, except they can only be written in SQL, and they rewrite a statement rather than actually updating directly. Views are actually implemented as SELECT rules (and can have DO INSTEAD inserts/update rules to make them updateable). Functions, triggers, and aggregates These can be written in any enabled language in the database, live in schemas. PostgreSQL allows you to define your own custom aggregate functions. Triggers are special classes of functions that have OLD and NEW variables available that hold a pointer to the OLD and NEW data. Triggers are bound to table. New in PostgreSQL 9.3 are event triggers which are bound to events such as creation of table or deletion of table. Operators, Operator Classes, Operator Families Live in schemas. Many are predefined, but more can be added and allow you to define things such as +, =, etc. for custom data types. Sequences Autocreated when defining columns as serial. In PostgreSQL, sequences are objects in their own right and can be shared across many tables. Types Live in schemas. Don’t forget that you have the flexibility to create your own custom data types in PostgreSQL. Foreign Data Wrappers, Servers and User Mappings Foreign Data Wrappers are remote data source drivers that allow you to access data in a non-PostgreSQL or remote PostgreSQL table. PostgreSQL 9.1 introduced these. 9.2 improved on general performance, and 9.3 introduced a new FDW called postgresfdw for connecting to other PostgreSQL servers, and also enhanced the API to support Foreign table updates. Extensions [9.1+] Packaging of functions, tables, and other objects for easy deployment in a database. These are installed using CREATE EXTENSION. PostgreSQL comes bundled with several tools useful for administration and query writing. psql Command-line client packaged with PostgreSQL. Good for automating SQL jobs, copying data, outputing simple HTML reports. createdb, dropdb For creating and dropping a database from the OS shell. pgAdminIII Popular graphical user interface packaged with PostgreSQL. pg_restore Command-line tool for restoring compressed or .tar backups. pg_dump Command-line tool for doing backups. Great for automated backups. pg_dumpall Command-line tool for dumping all databases into a single backup. pgAgent A daemon/service that can be downloaded from http://www.pgadmin.org/download/pgagent.php. Used for scheduling SQL jobs and batch shell jobs. Jobs can be added easily and monitored using the PgAdmin III job interface. pg_basebackup Used for doing filesystem hot backup of db data cluster. pg_upgrade Used for updating in place from one major version of PostgreSQL to another. -d Database. Defaults to the user (via system identification if no user is specified). -h Server host. Defaults to localhost if not specified. -p Port. Defaults to 5432 if not specified. -U Username you are trying to log in with. Defaults to system user name. $ psql -U postgres –p 5432 -d dzone -c "CREATE TABLE test(some_id serial PRIMARY KEY, some_text text);"
Once you are in the psql terminal there are a myriad of tasks you can perform. Below are some of the common ones. \dtv p* List tables and views that start with p.
\du List user/group roles and their group memberships and server level permissions. \d sometable List columns, data types, and constraints for a table. \i somefile Execute SQL script stored in a file. \o somefile Output contents to file. Retrieve prior commands Use up and down arrows. \timing Toggle query timing on and off; when on, query output includes timing information. \copy Copy from client computer to server and from server to client computer. Example: The following command string copies data to local client computer in CSV format with header. \copy ... from program Allows you to copy output from an external program such as ls, dir, wget, curl. New in 9.3. Below are common backup and restore statements. pg_restore -l -f "C:/toc.txt" "C:/somedb.backup"
pg_restore -h localhost -d db_to_restore -U someuser -L "C:/toc.txt" "C:/somedb.backup"
Requires reload and some require restart. pg_dumpall currently only dumps to plain-text SQL. pg_dumpall backups must be restored with psql. For space savings and flexibility, use pg_dump. With pg_dump compressed and .tar backups, you can selectively restore objects. You cannot selectively restore with plain-text backups. Below are common switches used with pg_dump [D], pg_restore [R], pg_dumpall [A]. These tools are packaged with PostgreSQL and are in the bin folder. They are also packaged with pgAdmin III and are in the PgAdmin III/version/ folder. -b, --blobs D Include large objects in dump. -d, R Specify name of database to restore to. -F, |t|p|d D R Specify backup file format (c = compressed, t = tar, p = plain text, d = directory). Plain-text backups must be restored with psql. Directory new in [9.2]. -c, --clean D R A Clean (drop) schema prior to create (for pg_dumpall drop database prior to create). -g, --globals-only A Dump only global objects (roles, schemas, tablespaces), no databases. -j, [8.4] , [9.2] D R Use this multiple parallel jobs to restore. This is especially useful for large backups and speeds them up significantly in many cases. 8.4 introduced parallel restore (pg_restore). 9.2 introduced (in pg_dump) parallel backup (needs to have format directory based). -l, --list R Print summarized TOC of the archive. -L, R Use TOC from this file for selcting/ordering output. -n, D R Dump/restore only select objects in schema(s). -N, D R Exclude from dump/restore named schema. -r, --roles-only A Dump only roles, no database or tablespace. -t, D Backup only named table(s) along with associated indexes, constraints, and rules. -T, D Exclude named table(s) from backup. -v --verbose D R A Controls verbosity. [9.2] D Exclude dumping table data for specific table. -s –-data|post-data|data [9.2] D R Dump or restore select parts. Pre-data just backs up or restores structures; post-data restores primary keys, foreign keys, and constraints. Data just restores data. --if-exists [9.4] D Use IF EXISTS when dropping. These are SQL commands you can use to control rights. They can be run in the PSQL interactive, loading an SQL file, or via PgAdmin. Many of the examples we have below use named schemas. If you leave out the schema, objects created will be in the first schema defined in the search_path and dropped by searching the search path sequentially for the named object. Changing database schema search path Sets the default schema to someschema. Dropping objects with no dependencies A drop without a CASCADE clause will not drop an object if there are objects that depend on it, such as views, functions, and tables. For drop database you should be connected to a database other than the one you’re dropping. [Prior to version 8.4, adding new columns to a view requires dropping and recreating]. Suppress redundant updates A built-in trigger that prevents updates that would not change any data. A table can have multiple triggers, and each trigger for a particular event on a table is run in alphabetical order of the named trigger. So if order is important, name your triggers such that they are sorted in the order you need them to run. These are examples that show case some of PostgreSQL popular or unique query features. Ordered aggregates, list scores in order of test date, one row for each student. Cast to make a string. PostgreSQL stands out from other databases with its extensive and extendable support for different languages to write database-stored functions. It allows you to call out to libraries native to that language. We will list the key language as well as some esoteric ones. The languages with an * are preinstalled with PostgreSQL and can be enabled. Some require further installs in addition to the language handler. You can create set returning functions, simple scalar functions, triggers, and aggregate functions with most of these languages. This allows for languages that are highly optimized for a particular task to work directly with data without having to always copy it out to process as you normally would need with a simple database storage device. Language handlers can be of two flavors: trusted and untrusted. An untrusted language can access the filesystem directly. SQL* (trusted) Enabled in all databases. Allows you to write simple functions and set returning functions in just SQL. The function internals are visible to the planner, so in many cases it performs better than other functions since the planner can strategize how to navigate based on the bigger query. It is simple and fast, but limited in functionality. CREATE OR   REPLACE FUNCTION prod_state(prev numeric, e1 numeric, e2 numeric). c* Built in and always enabled. Often used to extend PostgreSQL (e.g. postgis, pgsphere, tablefunc) or, for example, to introduce new windowing functions (introduced in PostgreSQL 8.4). Functions are referenced from a .so or .dll file. plpgsql* (trusted) Not always enabled, but packaged so it can be installed. This next table demonstrates some examples of writing functions in various languages. For all functions you write, you can use the CREATE or REPLACE FUNCTION construction to overwrite existing functions that take same arguments. We use CREATE FUNCTION here. plr Good for doing advanced stats and plotting using the R statistical language. $ psql -U postgres –p 5432 -d dzone -c \"CREATE TABLE test(some_id serial PRIMARY KEY, some_text text);\"
\\dtv p* List tables and views that start with p.
\\du List user/group roles and their group memberships and server level permissions. \\d sometable List columns, data types, and constraints for a table. \\i somefile Execute SQL script stored in a file. \\o somefile Output contents to file. \\timing Toggle query timing on and off; when on, query output includes timing information. \\copy Copy from client computer to server and from server to client computer. Example: The following command string copies data to local client computer in CSV format with header. \\copy ... from program Allows you to copy output from an external program such as ls, dir, wget, curl. New in 9.3.
pg_restore -l -f \"C:/toc.txt\" \"C:/somedb.backup\"
pg_restore -h localhost -d db_to_restore -U someuser -L \"C:/toc.txt\" \"C:/somedb.backup\"